In June, we brought you a story of an aspiring young local magician. In just a few short weeks since then, Ryan Russell, 14, of Germantown Hills has had a busy summer performing his magic at various events and will soon be on his biggest stage yet. Ryan is set to show his card tricks and predictions to potentially hundreds of children and adults at a mega-fundraiser for the Alzheimer’s Association on August 25 in the Avanti’s Dome, Pekin. The fundraiser venue will be a far cry from Ryan’s past performances which have primarily been with a seated audience and a hushed backdrop. On event day, the Dome -- a massive 76,000 feet with a ceiling height of 72 feet – will be bustling with activity with over 70 vendors displaying their wares and crafts. Ryan will be a standout because he will be performing. 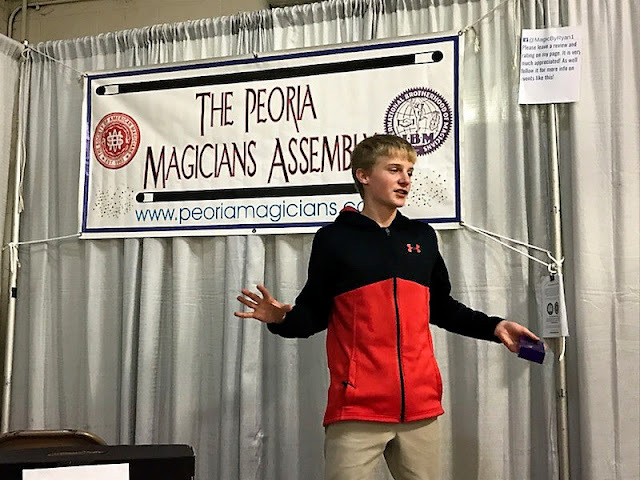 For two nights in July, Ryan gave performances at the Heart of Illinois Fair as part of the Peoria Magicians Assembly with crowd sizes of about 25 at each act. On Aug. 12, Ryan is co-hosting a fundraiser for St. Jude. He will perform close-up magic at the Kicking4Cancer event which is a kickball tournament to be held at noon at the Germantown Hills Middle School. An inspiration for the event comes from his good friend – Ian Wallace, 14, who has acute lymphoblastic leukemia and has been in treatment since his diagnosis in March 2017. Putting smiles on faces of his audiences, along with looks of amazement, and to make people happy is why Ryan says he wanted to become a magician – and that led to starting his own entertainment business. He performs at birthday parties, corporate events, special events, fundraising events, and wherever else his tricks and predictions will fascinate and mystify onlookers. For a schedule of his upcoming performances or for contact information, check his Facebook page: MagicbyRyan1. Ryan’s Facebook page and website were both designed by this enterprising youngster.